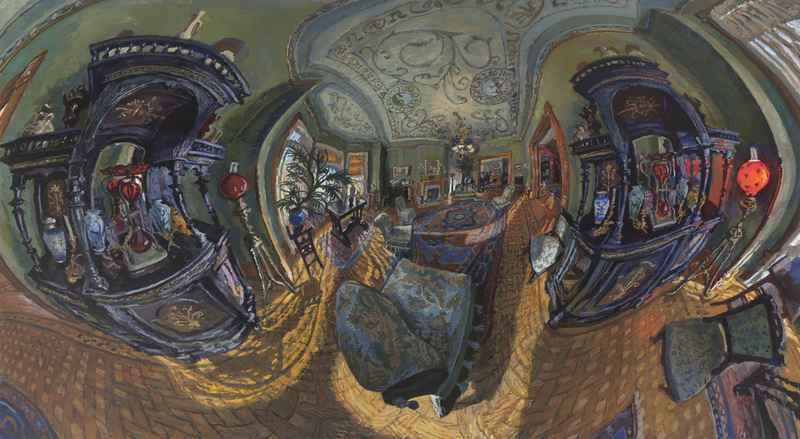 Matthew Lopas’s paintings issue from a deliberate rejection of traditional perspective systems and compositional aides like the viewfinder. In his teaching and online activities, he fosters awareness of and conversation about historical and contemporary methods of mapping space, particularly those that negotiate the entire visual field. An exhibition of his paintings, (Un)Distorted: Perceptual Paintings by Matthew Lopas, is on view at the Arts & Sciences center for Southeast Arkansas, Pine Bluff, AR, from August 27 to December 5. Also, Painting 360, a group exhibition curated by Lopas, runs from September 8 to October 30, 2015 at Hendrix College, with a reception (and lecture by Lopas) on Thursday, September 10. In 2013, Larry Groff of Painting Perceptions conducted a deep-delving interview with Lopas, which we definitely recommend. MWC has just a few questions to further the conversation. Sam King: Matthew, your process demands a high degree of analytical rigor, so I find it pleasantly surprising that in many of the works, I feel something like whimsy. There is a playful freshness in your representations of space. I’m curious about that aspect of the work – the sense of levity and play – where does it come from? Do you seek it out, or is it a kind of by product of working? Matthew Lopas: I choose locations to paint that give me painting opportunities which will produce surprises. As a location and an image reveal themselves, the unexpected can feel whimsical. Perhaps the sunlight is one place at 9am, and another place at 4pm. I often paint it both ways within the same image. That fills me with joy. SK: You grew up in Evanston, IL, but as an Associate Professor at Hendrix College, you’ve come to know Arkansas as home. What effects have your day-to-day surroundings had on your painting over the years? ML: Discovering the Historic District in Little Rock gave me a subject that I can relate to as well as a way to reach out into the world as an artist. I go there and paint houses that inspire me. For many years I painted the places I lived. That is a much different experience logistically and emotionally. Going to other people’s homes helps me complicate the work and enables me to tap into the experiences of others. 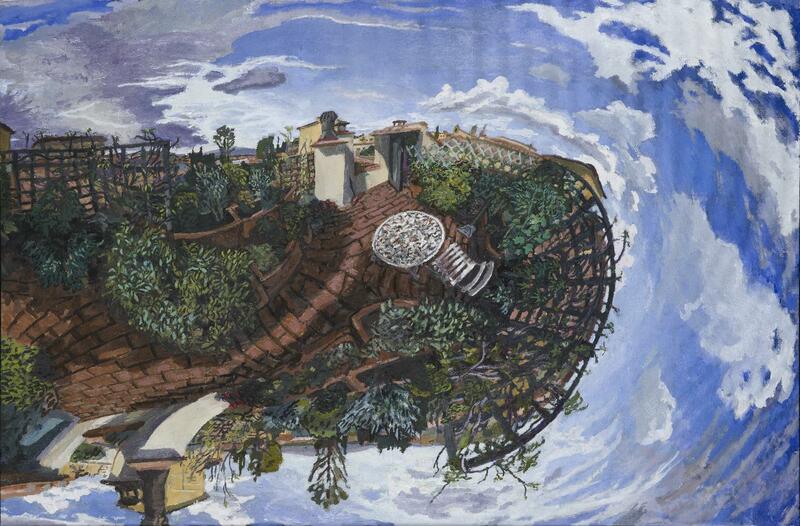 SK: It’s as if the motif itself is sprawling outward, too—not just the view of it. It begins with the immediate (the personal), and then you trace connections in the wider world: houses of a certain period, houses that yield particular, resonant sensations. Do you feel that kind of powerful draw to specific periods of painting, as well? What about those periods resonates? ML: I have heroes in every period of Art History. There is a great deal of painting that I love, have looked at, and learned from. But resonance is something different from that. For a painting to resonate it should be with you when you paint. It should guide you when you make decisions. It should occur to you in moments of reverie. For me those are individual artists or specific paintings, rather than periods. That’s because I think all works of art that exist are in some sense contemporary. If you can stand in front of it now, you can experience it totally on your own terms, regardless of its place in history. 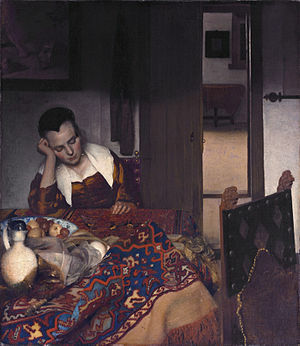 So I’ll start with Vermeer’s A Girl Asleep. I love all Vermeer, but this one feels much more relevant. The light is less uplifting than in his other works. In many of his paintings a holy light comes through a window to illuminate a female figure. In A Girl Asleep the light is about a specific human mood, rather than a beatific quality. The composition is so complicated and full. The shapes move into each other in such a surprising way. The space is very compressed and then opens up into another room. The light is so soft and dim. It captures a dreamy moment of quietness and introversion. I can immediately feel the stirring presence of her in that room. My paintings are much more ecstatic and in motion than Vermeer’s. But I do paint the profound presence of the people who inhabit them. I love Vilhelm Hammershoi for all the reasons I love Vermeer. But his light is more modern. His light has a tenuous softness, a cold quality that moves me. My paintings are much warmer than his, but I want my light to imbue my paintings with a similar sense of catharsis. SK: Who or what would you say is your least-likely-to-be-predicted influence—for instance, an artist (or writer, scientist, etc.) whose sensibility might at first seem very far away from your own, but to whom you feel a meaningful connection; or an experience (art or otherwise) that was formative, but perhaps not readily detected on the surface of your work? ML: There is a character in Gabriel Garcia Marquez’ book One Hundred Years of Solitude, the old Colonel [Aureliano Buendía], who spent years making small, delicate, bejeweled fish. If I remember the story correctly, he would make and unmake, and then remake them. It struck me at the time as incredibly strange and insane. But I realized later that the quiet patience, the focused intensity, needed to do what he did is a state of mind that I seek in my paintings. It’s a state of mind that calls me back again and again. Much of making a large painting is vigorous and physically challenging work. But doing that leads to moments of the finest, slowest, work. The moment before the brush touches the canvas is filled with an almost dizzying sense of expectation. As the brush gently moves over the surface, the entire space I am in, and every stroke made previously, is with me in a rush of sensation. I am in many places at once. SK: Both the Garcia Marquez analogy and your personal anecdote seem to me to point to something essential about painting, or art in general. Some people can’t justify it. It’s frivolous to them. Unless they are initiated into that experience, or a similar one, they’ll never understand why it absolutely has to happen for artists. Because there’s always that gap of understanding, there’s a real risk you could be staking your claim on something absurd, but to make great work, you have to risk the absurd. Who do you see as big risk-takers, for whom the risk was/is worth it? ML: Art is hard to justify in this world of stark contrasts in wealth and education. We seem to think of so many things in strictly utilitarian terms. And most Art is basically useless. So it is a risk for people to dedicate themselves to something that is basically useless. You risk derision. You risk wasting your time. You risk financial ruin. And why put out all that effort? I can see why so many sensible people will never understand. But what are they missing? Just imagine what our world would be like without art or creativity! The creative spark knows no limits of medium, nationality, or utility. It is who we are as humans. It renews us and makes our short lives interesting. It may not always be as profitable as selling shoes, but it is a whole lot more compelling. But I also think that given our culture of entrepreneurial capitalism and our love of the avant-garde, we diminish creativity by fetishizing risk. We lionize Picasso and Steve Jobs. We want art to be “new” and “contemporary.” Perhaps we would be better off if we valued art that is honest and authentic. In this sense “risk” is overrated. But if you think of “risk” as something internal, as having courage to do something that you have not seen before and therefore no one has told you is “good,” then there was never a worthy artist who did not take risks. SK: I’d like to throw in a pair of classic MWC interview requests, too. Please share a piece of advice you received in school (or elsewhere) that was helpful, and something important that you had to learn for yourself. ML: My mother once said to me that “all you have is what you do everyday.” You have to love what you do with your time because there is nothing else. For me I have learned that painting is a process that produces a state of mind. It is best when no other concerns invade it. The judgment of others or yourself, the reception of the art world, are hindrances. Paintings are best when made from a state of pure absolute personal need. You must give yourself permission and space to get to it and then notice when you are ripe for working well. SK: Matthew, thanks so much for spending quality time with these questions! Love the questions and answer about risk. Good one, Sam and Matthew! It’s such an obvious one, but hard to talk about so directly. You guys pull it off, though! brilliant interview. Thanks for the legwork of introducing me to great artists. Thanks Sam for the interview! Thinking about space as something to fill or just as something not nothing .